← When Google Said That They Wanted All the World’s Knowledge Online, This Wasn’t What I Had In Mind. Building “Peg”: Steely Dan On the Creation of Their Classic Aja. Exactly twice, I’ve bought DVDs after seeing clips cut out of them on YouTube. One was Kraftwerk’s live, 2005 Minimum-Maximum DVD, which I then wrote about on Media Assassin. The other is from the 2000 documentary Steely Dan: Aja, from the Eagle Rock Entertainment Classic Albums DVD series on the making of legendary discs. 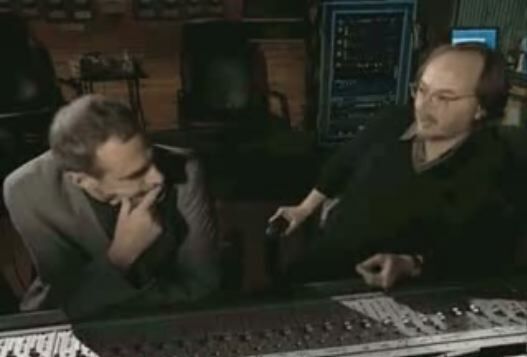 Directed by Alan Lewens, the work features Donald Fagen and Walter Becker, above, revisiting the multitracks of their 5x platinum, 40-minute, 1977 masterwork, Aja. Joining them, however, are some of the numerous session musicians who constructed the CD’s seven cuts out of Fagan and Becker’s wonky musical ideas. The result, if you, like me, adore this album, is nearly ethereal. Not only is it super-moving to hear Aja‘s creators talk about putting together, by trial-and-error, passages that are, now, bedrocks of pop music history, but one also gets to see the musicians recreate those moments of discovery. For example, in the “Peg” YouTube, Rick Marotta laying down the recording’s famed beat, or Chuck Rainey’s walking his polyrhythmic bass. 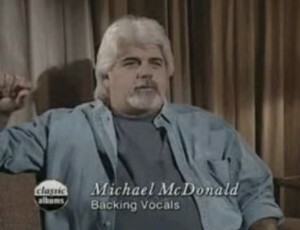 My high point in the 8:41 clip, below, has to be Michael McDonald, right, revisiting his only-dogs-can-hear-it “Peggggggg” on the chorus, as well as the angular, layered harmonies that make that section so verdant. Before seeing this feature, McDonald’s up-note had always struck me as a sort of machine-like piece of studio trickery, like feedback, not the actual output of a real human being. Watching him discuss the performance, though, not only deepens my appreciation of his artistry, but the detail with which Fagan and Becker finished and polished every second of Aja. I wish Public Enemy would do one of these for Nation of Millions. Highly, highly recommended. Classic Albums: Steely-Dan: Aja, $11.98. Thanks for this, Harry. Some of the songs on this album are able to take me right back to ’77. I was 14 when this album came out and I loved it then even tho I didn’t really understand it. I still love it today. Thanks for sharing…..gotta check to see if I have any SD here at work. I was doing the Electric Slide in my head to “Peg” and wishing to hear some remixes, or at least an extended version.